150m+ Buildings 29 Completed • 9 Under Constr. 300m+ Buildings 3 Completed • 2 Under Constr. The tour began with the Broad Sustainable Building (BSB) campus including the New-Ark Hotel. The group also visited Broad’s construction site of a 59-story tower. 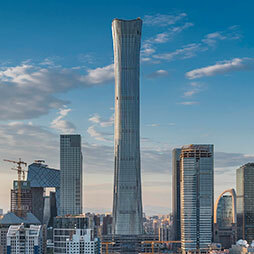 With over 1.3 billion citizens and a rapidly urbanizing population, China is developing tall buildings more than any other country globally. Attendees enjoyed an exclusive tour of the China Broad Group Facilities and spent the night in the T30 Hotel. The tour covered the company's manufacturing and research facilities. CTBUH’s Executive Director tours the headquarters of the company behind the 30-story tower erected in 15 days. Now they want to build the world’s tallest tower in nine months. Broad Sustainable Buildings 30-story test building withstands a 9-magnitude earthquake test. Time lapse of the New Ark Hotel being constructed in 6 days. Time lapse of T30 Hotel being constructed in just 15 days. Jun 2014 – International Journal of High-Rise Buildings Volume 3 Number 2; Zhou Jianlong, Lu Daoyuan, Huang Liang, et al. Debating Tall: Is Sky City's Prefabricated Approach Viable for the Future of Megatall Buildings?